The previous year was an interesting one for me. Last July marked five years of retirement, which has been great, but part of me misses the high information content and challenges work threw at me daily. I’ve tried to keep busy with my own pursuits, one of which was a temporary obsession with the Kīlauea volcano on the Big Island, Hawai‘i. I wrote about this back in August, just after the (unprecedented) activity subsided. At the time, no one knew if the volcano was just taking a breath, or if the lava flow was really over. At this point we know it was over; there has been no activity since. For two-and-a-half months, though, it was an impressive display of the undeniable power of Mother Earth and, in particular, her fiery daughter Pele. If you didn’t read that previous post, you should now. Or not, if you’re very familiar with the situation and events. This post assumes readers have at least some background. I’ll pause in case anyone needs a moment to catch up (or grab a cup of coffee; this is a long one). To pick up the narrative, last August 2nd, just before noon, Hawaii time, there was what turned out to be the final collapse/explosion event. Like most of the others, it was a magnitude 5.3 event. 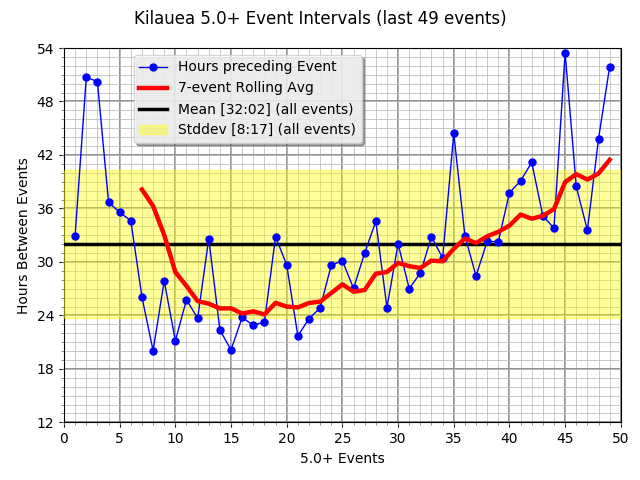 Unlike the others, it came 52 hours after the previous big event (the average was 32). Some of that variance is still apparent in the earliest events. Once things got going, the intervals were fairly stable (and shortest of the set). As the system equalized, the intervals got longer and longer. Below is a chart that tries to provide a sense of the energy expended each day by the activity. The earthquake magnitude scale is logarithmic (one step is 32 times; two steps is 1000 times), so I used the magnitude numbers as exponents (took their antilogs). That should make the scale linear. There are ways to use constants and some math to come out with numbers in Newton-meters or dyne-centimeters or joule-whatnots, but this gives a relative flavor of the energy involved. Notice that the numbers are big! The off-the-chart spike, on May 4th, includes three events. An M5.4 around 11:30 AM Hawaii time, a whopping huge M6.9 almost exactly an hour later, and then an M5.3 about two hours after that. There had been an M5.1 the day before, which was the first M5.0+ event of the year. Then 25 hours later, things really got going. It also seems the energy ramped up to a peak during June and then faded slightly in July. It’s the sharp cut-off in early August that’s most interesting. The whole thing just shut down! It’s been quiet ever since. 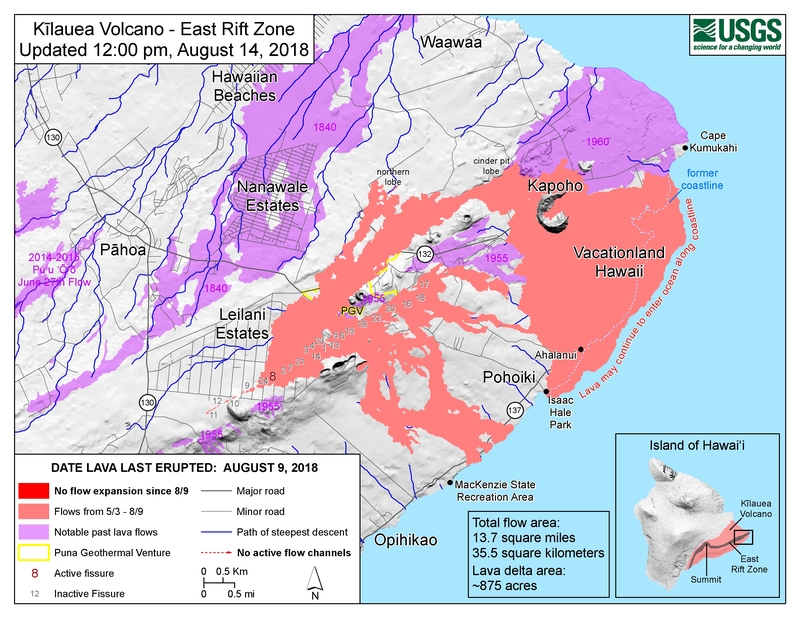 The general consensus by geologists is that in very early May some key event opened up the Lower East Rift Zone (LERZ), which allowed magma to drain from the reservoir directly beneath Kīlauea into the LERZ. The understanding is that the magma replenishment from deep in the Earth is much less than the volume of magma flowing out of Kīlauea and into the LERZ. The means the reservoir was being emptied, which is why Kīlauea collapsed every 32 (or so) hours. The explosion part comes from rocks collapsing into magma. Incidentally, the image we all have of an underground lake of magma beneath a volcano is believed incorrect. The better image is more sponge-like, a zone of fractured rock filled with molten rock. Near the center, it’s nearly entirely fluid magma, but it’s cooler moving outward, and some rock crystalizes. The further from the center, the more rock-like the zone is. This has made it extremely hard to radar image magma “chambers” because there really isn’t a chamber. Attempts have led to wildly different estimates, because it depends on what’s considered rock and what’s considered magma, and there’s no hard line. 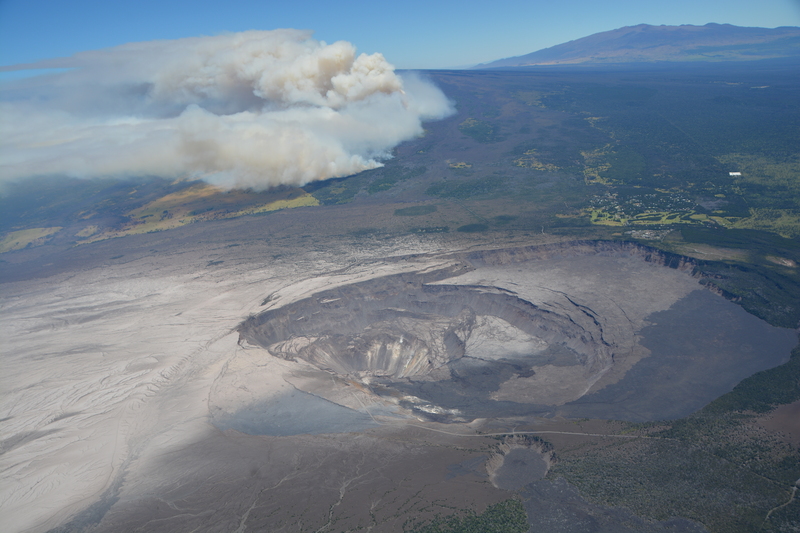 13.7 square miles covered in a blanket of lava, 30–80 feet thick in places. 875 acres (just under 1.4 square miles) of new land in what used to be Kapaho bay and off-shore areas southeast of Puna. 30 miles (approx) of road covered in lava. 60,000 earthquakes between April 30 and August 4. 4,400 earthquakes with magnitude 3.0 or higher. Pele spread nearly one billion cubic yards of lava. Enough to fill over a quarter-million Olympic swimming pools. The reddish-orange shows the new lava from this summer. Kīlauea summit. Pele’s roof has fallen into her home! The result of 60,000 earthquakes (57 of them M5.0+ and close)! Summit of Kīlauea before Pele woke up (image from 2010). Call the roofers, she brought down the house!! A question for geologists is what happens next. Does magma return to the summit and re-inflate the mountain? Or is it possible neighboring Muana Loa will wake up? Some resonance between the two has occurred in the past. There is a connection in that all Hawaiian volcanoes are fed by the same magma source many kilometers deep. For me it was an education into volcanoes in general, Hawaiian volcanoes especially (which are different from subduction volcanoes), and Kīlauea in particular. This affected people in an immediate and personal way. For a few thousand or so, it was a catastrophic interruption to the flow of their lives. Everyone affected is still picking up the pieces. I’ve always enjoyed working with data, especially when I can visualize it, and this was a lot more real and interesting than any blog stats. Especially when I realized earthquake data is 3D by nature: it has a latitude, longitude, and depth. As such it lends itself to a 3D model. 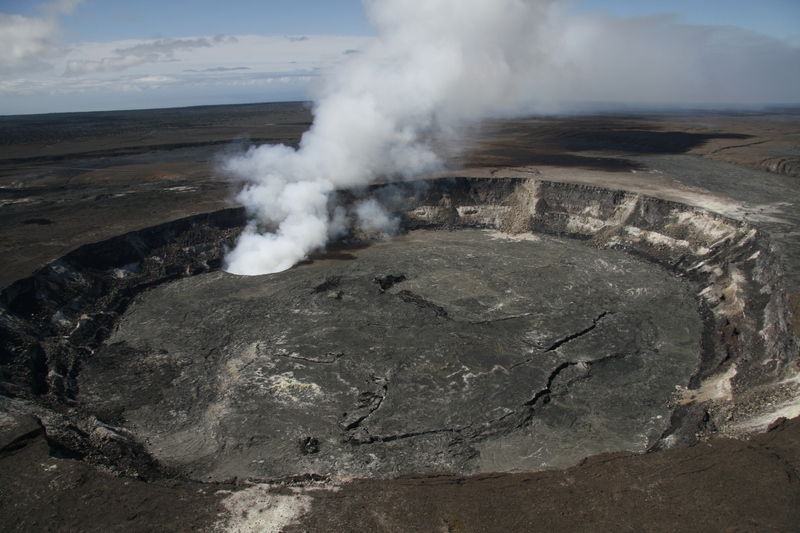 The short movie above circles the area beneath Kīlauea at a depth of 2 km. A ghostly height map of the island serves as a reference. Earthquakes are color-coded balls; M2=blue, M3=green, M4=yellow, M5=red, & M6=purple (for the lone M6.9 event on May 4). On the first trip around, all events show. In the second trip, no M2 events. On the third, only M4, M5, and the M6.9 show. What’s interesting is how the M2 events (blue) define the volume of the magma “chamber” (“zone” may be a better word). The green M3 events show more structure, and seem to indicate two distinct areas. The two areas of green are quite clear. I’ve wondered what they mean. The black triangle is at the GPS coordinates for Kīlauea (-155.286762, +19.421097; 1.247 km). See the road running along the bottom of the crater? And the parking lot just a little to the right of center? That whole parking lot fell in along with bits of the road. It does appear off in the distance in the video above. It swings past in the background, most noticeably starting at 1:32. What seems clear is that something happened in the LERZ, something big in the first few days of May. Whatever it was opened a pathway for magma stored below Kīlauea to move into the LERZ where it erupted from two dozen fissures (#8 being the most notable). One thing geologists observed is that the first lava to erupt was “old” (cooler and different chemically) from the lava that came later. The belief is the first lava was magma that had been stored in the LERZ system and had thus cooled. The later lava came from beneath Kīlauea and was fresher. I’ll leave you with one last video. This one is from much further away and much deeper. The color-coding is the same as above. The view is from 25 km. The LERZ starts on the right and rotates towards the viewer as the video begins. The square box grid extends down into the earth 50 km with grids every 10 km. It’s half a degree on a side. As before, three rotations show three different data views. One thing that interests me in this one is the cluster of events down around 35 km. I wonder what that is. One of my tests matching the height map to the EQ data. Looking at the caldera with a “needle” pointing at the GPS location of Halema’uma’u (the smaller crater). Dead on spot! I thought I was done with my adventure here, but the new laptop has a tool that might allow much higher quality videos. Also, the island height map is cut off on all four edges (the maps are available by grid square). In particular, this cuts off part of the Puna district where the LERZ is. That part, especially, I’d like to have whole! Since the data in the height map squares are normalized, matching squares is a trick. I tried a few approaches and didn’t like the results, so if I want a complete height map, I’ll need to keep at it. My grand idea is a video that starts way up high above the island, comes down for a few rotations at a distance (like Pele 8 above) and then zooms in a points of interest. Not sure I’ll ever get there, but it’s a goal. If I never do, at least I had fun! This entry was posted on Sunday, January 13th, 2019 at 8:08 am	and tagged with earthquake, fissure 8, fissure vent, Hawaii, Kilauea, lava, magma, Pele, USGS, volcano and posted in Science, Wednesday Wow. You can follow any responses to this entry through the RSS 2.0 feed. I’m not really familiar enough with this stuff to have much to comment on here, except to note that occasionally the planet reminds us that we live in a thin layer on its outer edge, and that there are forces far greater than anything we currently do beneath us, and which could at any time overturn our little world. And tell me about it! I was born in New York city (hurricanes; I missed my first day of kindergarten because of one). I lived two decades in Los Angeles (earthquakes; been through several of those). Now I live in Minnesota (tornadoes; so far I haven’t actually seen one, although I’ve seen plenty of the damage they do). I’ve been in my share of hurricanes. And seen a tornado from much closer than I ever want to again; those things are monsters. And been around flooding enough to know it’s much more dangerous that it appears. Never been in an earthquake though, or anywhere around a volcano. So monstrous! Quite a few years back, I drove past St.Pete, MN, (past because roads through town were closed due to damage) after a one-mile wide funnel passed through. Miles of phone poles snapped off at their base! Flooding I’ve managed to escape (I live on high ground), but I know how serious it can be. California also has forest fires. I’ve never been close, but seen them in the far distance across the ocean. The fractal nature of flames really strikes you then. A giant forest fire 30 miles away has flames that look like the flames of a small, close fire. Very weird! I’m always so very impressed by the energy involved in these natural events (as you said, ‘forces far greater’). Our best single actions seem so puny. Maybe the Tsar Bomba is the biggest thing we’ve ever done? Volcanoes are interesting to me in how they can (at least temporarily) change the entire planet by releasing tons of greeehouse gases along with particulates. Volcanic activity is a key suspect in parts of Europe’s Little Ice Age. That recent tsunami in Indonesia was due to a volcano collapsing! Living as we do on the frozen crust of an inner ocean of magma, we should probably count ourselves lucky that those events are as rare as they are. I know Earth has had periods in its history, lasting for millions of years, when they weren’t rare. Don’t know if you’ve ever heard of N.K. Jemisin’s ‘The Fifth Season’, but it describes a far future where the earth is constantly erupting and destroying civilization, except for brief respites where it recovers for a while. The causes in the story are ultimately supernatural, but it could easily have been a sci-fi premise. Haven’t heard of the book. It’s interesting to speculate on what natural SF causes one might come up with.